We are open to the public – Sorry no dogs allowed. 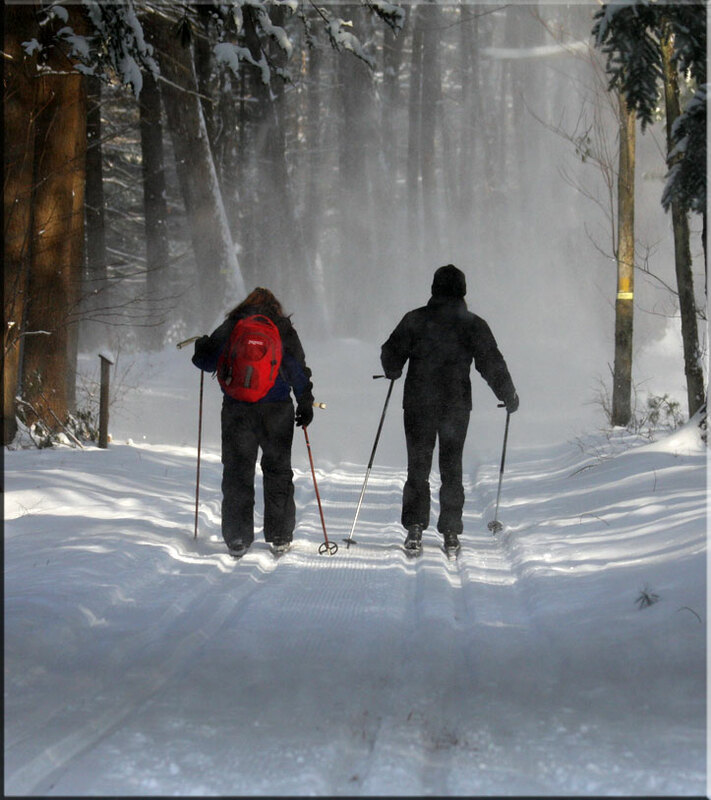 In the winter, Winding Trails turns into a virtual winter wonderland with activities such as cross country skiing, snowshoeing, ice skating, and sledding. Three hundred fifty acres of pristine woodland, lakes and wildlife provide a gorgeous setting for the cross-country ski center. Established in 1972, the facilities have since undergone over thirty years of expansion and improvements. The Winding Trails Cross Country Ski Center offers both the beginner and experienced skier a high quality, enjoyable experience. A variety of daily activities provide fun for the whole family. Members are exempt from the trail fees. Rental fees, however, do apply. Overnight accommodations are available at several nearby inns and motels. Cross Country Skiing – Trails and grooming are the heart of cross-country enjoyment. Winding Trails’ 20 kilometer trail system is groomed daily. Skiers find hours of pleasure traveling through the 350 acres of prime woodland, brooks and spring fed ponds. The wide, double tracked trails on gently rolling terrain provide even the first time skier with a positive and fun experience. The entire Winding Trails cross-country trail system is completely mapped and marked with degrees of difficulty. Rental Center – Winding Trails is an authorized Fischer Rental Center, complete with all new rental equipment and the latest in Nordic gear. With over 250 sets of rental equipment available (including skating skis), we can accommodate a wide variety of sizes to ensure all members of the family have the opportunity to enjoy the facility. Pulk sleds for towing your infant or toddler are also available for rent. Retail Shop – See just how great our skis perform by taking a spin on the snow before you buy. The retail shop is stocked with the latest equipment and accessories including waxes, hats and gloves. Ski Lodge – Our lodge welcomes you with a toasty fire offering relaxation and comfort. A snack bar serves light refreshments throughout the day. Indoor and outdoor tables invite you to picnic within the cozy warmth of the lodge or among the crisp scent of frosty pines. Ice Skating – Eight Acre Walton Pond is available for ice skating weather permitting and is resurfaced often. Grooming – Winding Trails has some of the latest cross-country skiing equipment available on the market. Although we do need the help of Mother Nature, we can turn marginal snow conditions into great skiing. Whether it is packing and combing a trail for ski skating or setting tracks for diagonal stride our staff take pride and time in making sure our trail conditions are the best they can possibly be. Mid-December through Mid-March, depending on snowfall. All programs & events are weather permitting. Please no snowshoeing or walking on groomed ski trails. Pets not allowed on the premises at any time. Trails 20km, all track set and groomed.